The Courtesan Prince is a rich tapestry of intrigues, power struggles and affairs. The story is set thousands of years after Earth sent out colonists to the far reaches of space. These colonists have evolved into two distinct and separate societies, Reetions and Gelacks. The Reetions are a mostly democratic society that uses computers and technology to maintain their peace. The Gelacks have a society based on genetic purity, strength, and a complex code of honour that is maintained by the sword. The last time these two cultures met, there was a war that killed many, even destroying planets and space stations. Now the Reetions and the Gelacks are encroaching on each other’s borders again. Ranar, a Reetion scientist and diplomat, wants the interaction between the Reetions and the Gelacks to be official, and delicately handled, so he has enlisted the help of Anne, a young female space pilot, to learn the space jump to Trinket Ring, a space station on the border of Gelack space. The principle character on the Gelack side is Von, a very handsome young courtesan, and sword dancer. Von is so very beautiful that he attracts more attention than is healthy for him and for those he cares about. If you have read The Throne Price, by Lynda Williams and Alison Sinclair, the first third of The Courtesan Prince may seem a bit slow. This is because there are explanations of Reetion and Gelack society that you may already know. 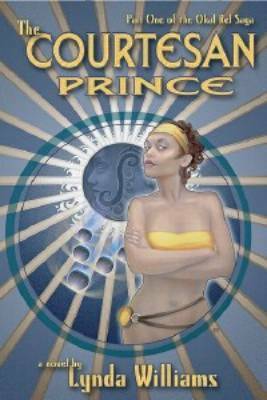 Don’t let it slow you down, because The Courtesan Prince is well worth the read.